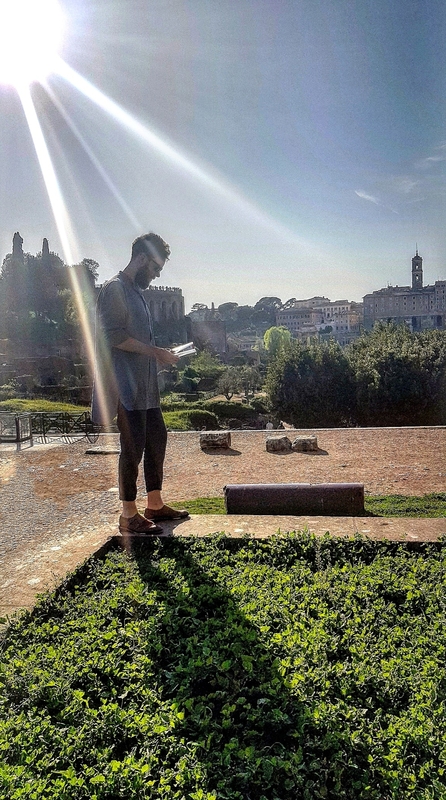 Our latest trip saw myself and the team fly out to Rome to cover a few shoots. Before we set out on our next adventure I wanted to scout out a few new pieces to take with us on our journey and as ever, consulted the oracle of modern menswear; MR PORTER. I browse the site daily, but this time I was looking for some inspiration before this month’s destination. As I scrolled through the trends section something peaked my interest; the oversized trend. I felt inspired and started to think how I could put my personal stamp on an ‘oversized look’. Further browsing brought me to an article by Mr Adam Welch, Editorial Director for MR PORTER. The piece entitled Why oversized clothing is the next big thing explores how power players such as Balenciaga and Raf Simons are constantly pushing the boundaries and evidently asking the question, ‘how oversized can we go’? In the article Mr Welch recommended some ‘big investments’ (nicely done!). I came across many great options from Balenciaga, Stella McCartney and Acne Studios before spotting the perfect piece; the EIDOS Oversized Grandad-Collar Slub Cotton And Silk-Blend Chambray Shirt. Anticipating higher temperatures, I saw this as the perfect opportunity to experiment with some oversized shirting; this particular chambray shirt was the ideal statement piece for my upcoming travels. EIDOS is the offshoot of tailoring institution Isaia, I was, therefore, safe in the knowledge that this offering would be both sophisticated and expertly made. The shirt, cut in Italy (perhaps this sub-consciously influenced my choice?) from tactile slub cotton and silk-blend chambray would deliver the perfect statement silhouette I was after. 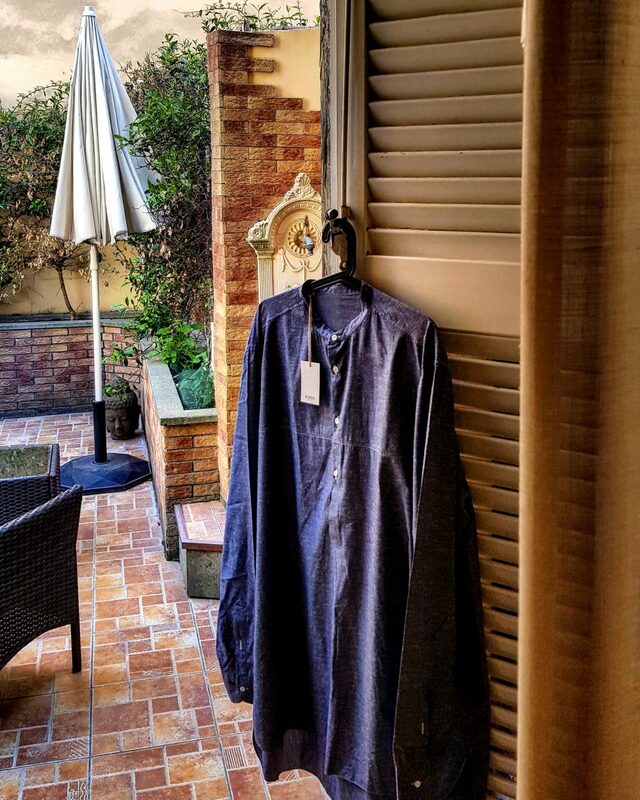 We landed in Rome and from the moment I un-boxed the indigo slub shirt I knew oversized clothing would be making a regular appearance in my everyday wear. I’d checked the forecast for the day and it was going to reach the high twenties. As the EIDOS piece hung from the doors leading to our apartment terrace, it blew softly in the morning breeze confirming to me it would be the ideal outfit for the day’s forecast. I decided to pair the chambray with a pair of relaxed navy trousers and a slick pair of double monks. A look I felt would work well in our new surroundings and yet be versatile enough for the day ahead. The sun was intense. As we headed into the historical centre it was approaching midday and the mercury had hit the high twenties already. Although travelling is a massive perk for us here at OTC, and we certainly aren’t complaining, it does mean that life can be pretty hectic. A hectic life calls for comfortable clothing- a key element that caught my eye with the oversized trend. 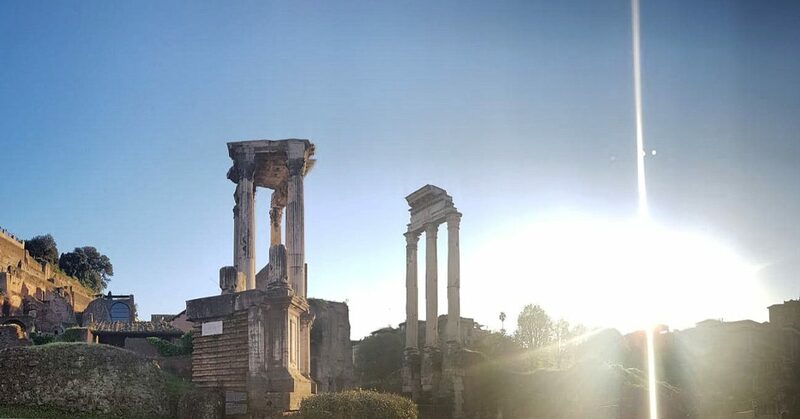 As we walked through the Roman Forum, the sun was beating down through the ancient ruins of Rome; the breathability of the overall look I had put together meant that comfort was not an issue. I’m most definitely not a sun-worshipper as the heat can get too much for me, but EIDOS’s cotton-silk mix, along with the ‘anti-fit’ cut of the shirt allowed me to keep my cool on what could have been a very sticky day (literally and physically!). The baggy fit allowed air circulation throughout the day. I literally had the wind beneath my wings as I overlooked the city. 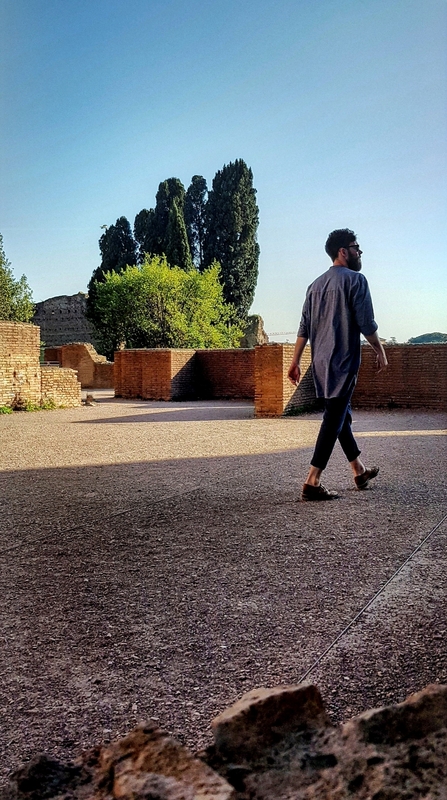 You’d assume that a fitted tee would be the best choice for such a hot day but I can honestly say this Italian oversized shirt had kept me cooler than anything I’d worn in the heat before. The button-cuffed sleeves enabled me to roll the sleeves up for a more casual day time look, ideal when the weather was as fine as it was. 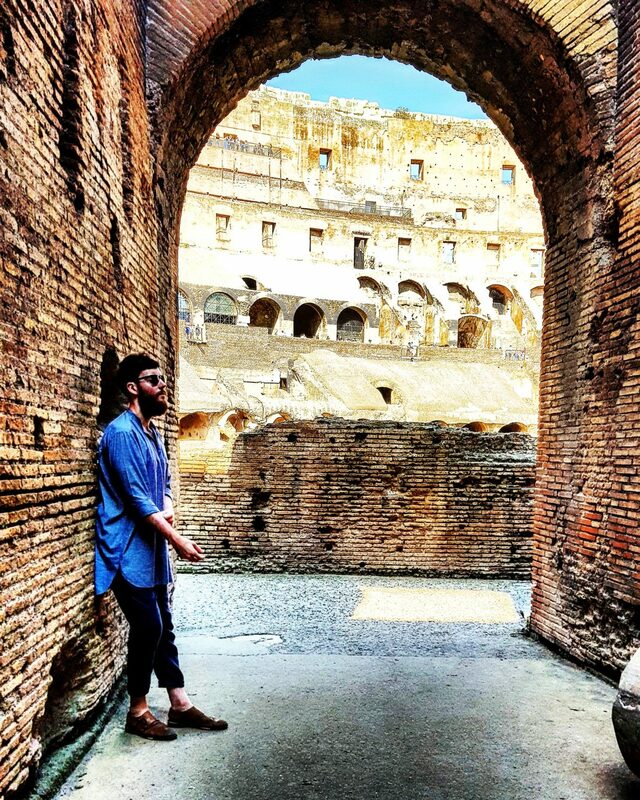 We wanted to grab some shots here as you simply can’t go to Rome without visiting this amazing piece of history. Despite the blistering heat I was confident and ready for any photo opportunities, namely because my outfit had really given me a boost. No skin-tight sticky clothes to worry about while feeling right on trend. 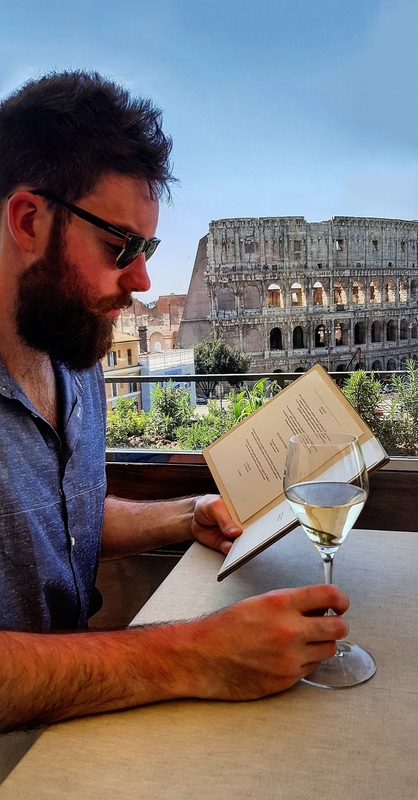 A lunch date with the gladiators was well earned after a busy morning ‘Rome’ing around’. We stopped off at the Michelin-star roof top restaurant, Aroma, which housed the most spectacular view. 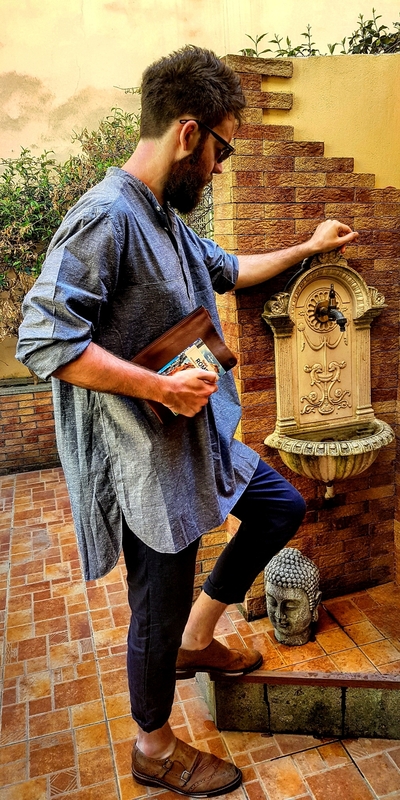 As we all know, most fancy eateries and bars have strict dress codes; the expertise that has gone into making this shirt with its subtle nods to sophistication meant I was well at ease with any such dress code. The oversized shirt is the perfect balance of casual and sophisticated; you’d effortlessly slot in at that edgy bar in down in Shoreditch or an upmarket Chelsea restaurant; pair that with the comfort-ability factor and you have a winner of a trend. 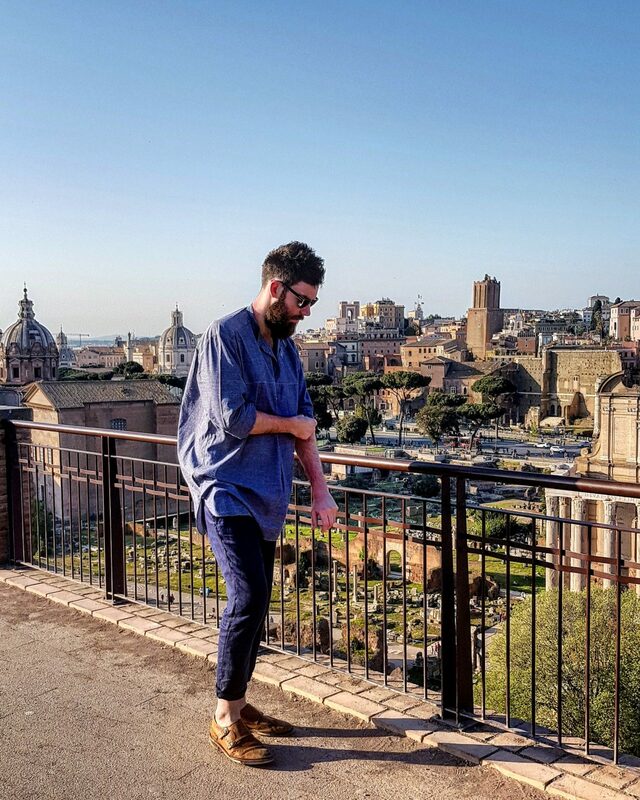 They say Rome wasn’t built in a day, but with the help of MR PORTER’s consistent on-point trend advice and EIDOS’s ability to sculpt the perfectly ‘oversized’ shirt, I felt like I’d conquered it in a day! The EIDOS shirt featured is available at MR PORTER for £325 here. You can also shop their expertly put together oversized trend selection here. Check out more of our #500 series here.